Dappros is happy to announce the launch of alpha version of our TracyChain product. There is currently a barrier for logistics and supply chain industry to leverage the advantages of blockchain technology. The space of decentralized technologies is fragmented. Existent solutions have not been build with ease of integration in mind. TracyChain lowers the entry barrier and enables the players within logistics and supply chain space to put their assets onto blockchain with just few REST API calls. This means it is easy to integrate with legacy systems, drastically reducing the required time and budget investments when integrating blockchain into existing business processes. The demo allows to create an asset and track it on blockchain. It only requires one API call to create asset entity and another API call to create a trace of the asset. You can add arbitrary parameters such as asset/shipment name and description, GPS coordinates etc. 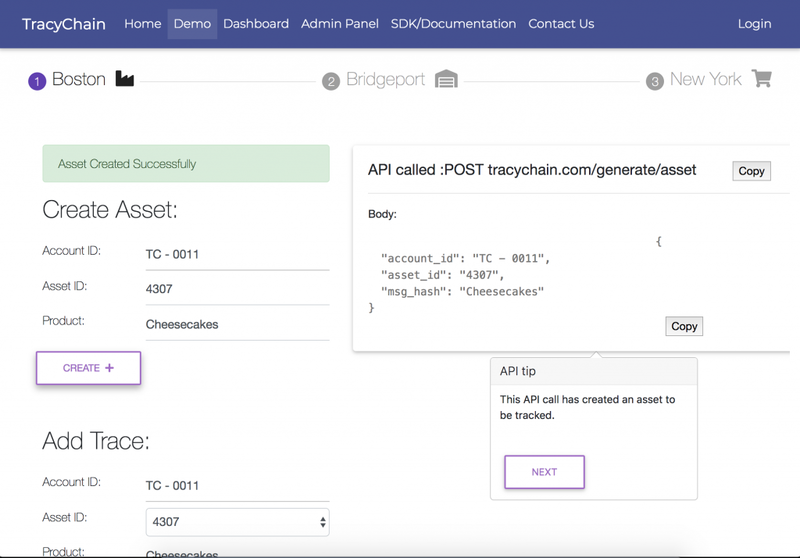 In our demo you send API calls to track an imaginary shipment of cheesecakes from a factory in Boston to warehouse in Bridgeport then to retail outlet in New York. You may however replace ‘cheesecakes’ and other parameters with your own custom data. All manipulations you do with our live demo along with all data you enter gets immediately synchronised on blockchain. This is powered by Dappros Platform which is implemented using private Ethereum infrastructure and is scaled via Amazon Web Services. Demo data is not anchored to public Ethereum network so don’t worry about cluttering thousands of nodes worldwide and feel free to experiment. Please join to try our demo and send us any feedback so we can improve the system and prioritise the requirements you might have.